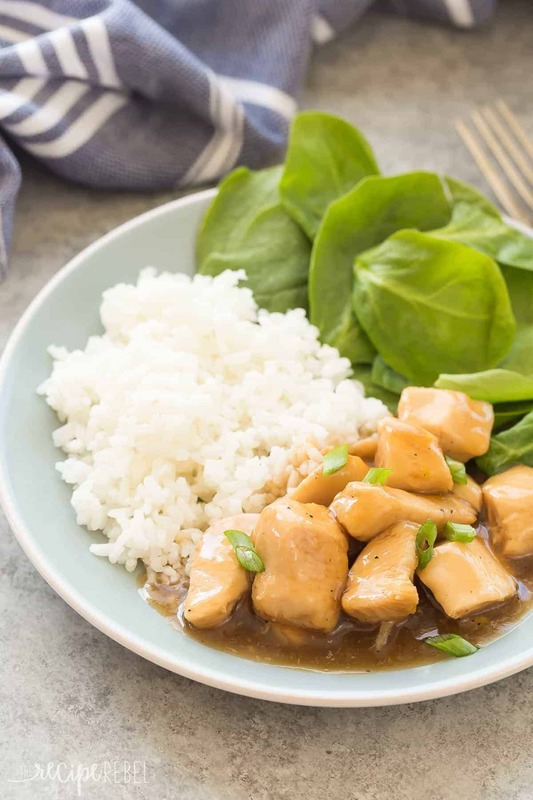 This Slow Cooker Honey Lemon Chicken is a little sweet, a little tangy and perfect over rice or noodles! It’s an easy crockpot meal for those busy days! Includes step by step recipe video. To be totally honest, I didn’t think I liked lemon chicken until I stumbled across the recipe for this Baked Honey Lemon Chicken in one of my Grandma’s old recipe books. Clearly, it was time for a revisit and a new twist: a slow cooker twist. It was destined to happen! One of my favorite ways to revamp recipes is to adapt for the slow cooker or crockpot, or update a slow cooker recipe by adding a one pot version. Because we are all about easy these days (really, ever since our first daughter arrived more than 5 years ago), and so I figure having more options for different kinds of easy is one of the best ways to help us all out. 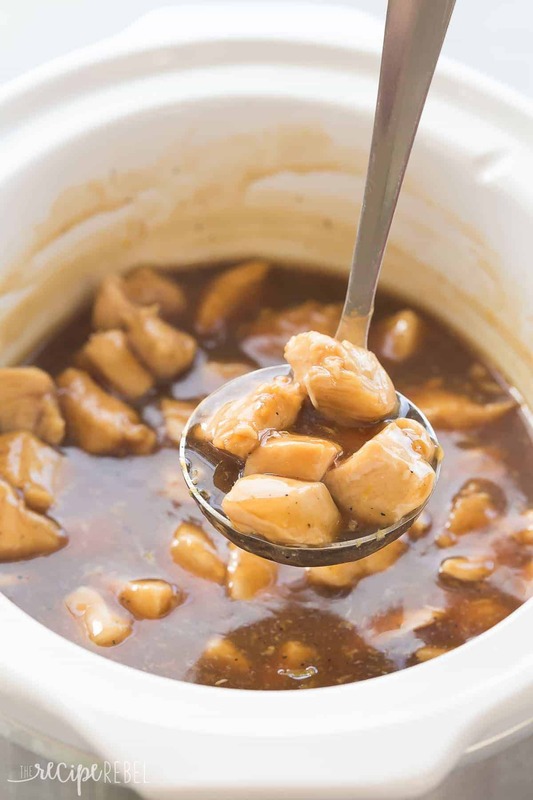 The great thing about cooking chicken in the slow cooker is that it doesn’t take too long, and so the sauce can hold onto a lot of its flavor. If you find that the flavors have dulled after cooking for several hours, try adding some fresh lemon zest to brighten it up before serving. We love this Honey Lemon Chicken served over rice best, but it’s also great over noodles or mashed potatoes, or just with a side of steamed or roasted vegetables! The options are endless. Don’t have a slow cooker? You can absolutely cook this up in a large pot on the stove top in a fraction of the time. It will be just as good! Taste the sauce after cooking to adjust the seasonings. If you think it needs a little more oomph, add a teaspoon of fresh lemon zest! In a 2.5-4 quart slow cooker, combine broth, honey, juice, soy sauce, salt, pepper and corn starch with a whisk until combined. Add chicken and stir to coat. If sauce is thin, mix another 1 tablespoon water and 1 tablespoon corn starch and stir into the sauce to thicken further. If desired, adjust seasonings and add lemon zest if desired (it will make it very lemony!). 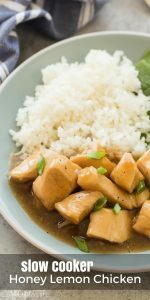 This Slow Cooker Honey Lemon Chicken is a little sweet, a little tangy and perfect over rice or noodles! It's an easy crockpot meal for those busy days! Includes step by step recipe video. My grandpa use to order lemon chicken at this Chinese restaurant every time we went and I was never a fan. However, as an adult, I have learned to love those tangy flavors. And the crockpot is my best friend when I’m busy during the week. One pot meals are the BEST! I hear the Instant pot makes things quite easy, but I haven’t made that plunge yet. YES! I have an Instant Pot but I haven’t used it much lately — I really need to do more experimenting with it!